We’re Brad & Grayson Kuan, a father-son duo from Saskatoon, SK. In 2016, we became the local go-to carbon fibre repair team. 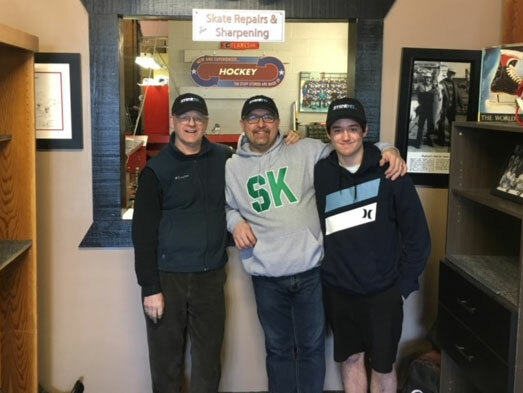 Since then, we have expanded to skate sharpening, custom stick sales, and a variety of equipment repairs. Our primary goals are to keep players in the game at an affordable cost and to keep broken sports equipment out of landfills. Check us out for all your hockey stick needs including blade and shaft repairs. Curve and lie changes are available upon request. StickFix can have your stick ready for play within 24 hours. We analyze all breaks with a keen eye for performance, durability, flex, and weight. We want to have you back in the game – perhaps even better than before! Our founder, Cliff Hendrickson has been repairing racquets along with other composite products since the late 1970s. In 2003, he was asked if could fix a composite hockey stick. He repaired the hockey stick and later asked how it held together and performed. The customer’s response was “Great! I felt no difference [in the stick]”. At this point, we knew we had a new product to work on. Along with tweaking from our chemical engineer, the StickFix Repair Process hit the market in January 2004. We became the answer to the broken hockey stick problem. We now offer enormous savings to parents and teams. StickFix is driven and has a relentless determination to continue being the best. We now have fifteen franchises in North America and continue to grow. We have a roll-up your sleeves mentality toward innovation, customer attention, a proven repair system, and exceptional service knowledge.